← Storm in Another Place. 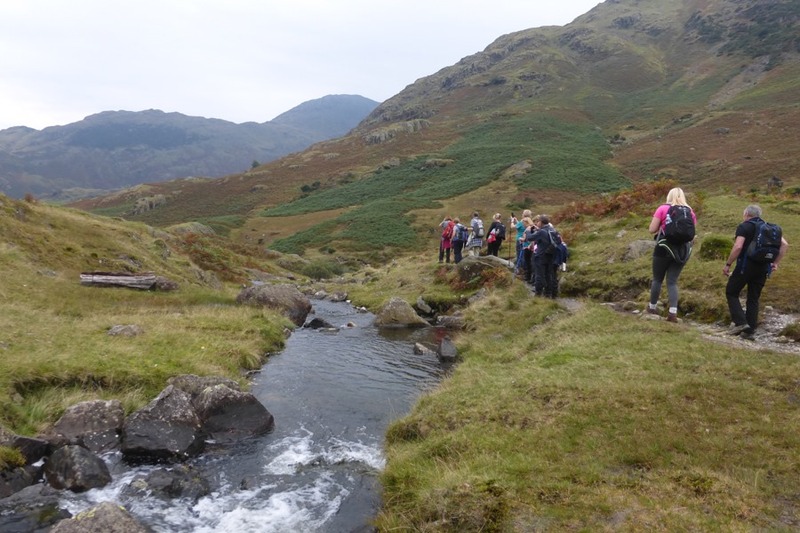 The Langdale Valley with CRC. 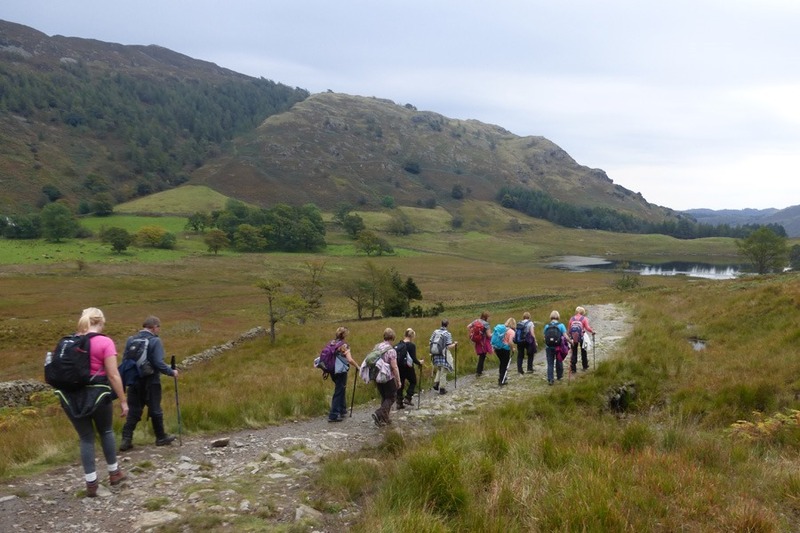 This weekend I went up to the Lake District with Crosby Rambling Club. 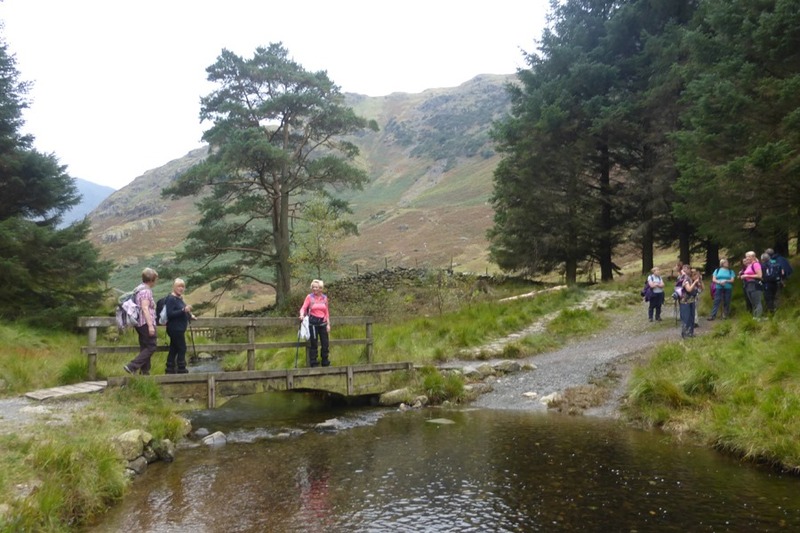 Our destination was Elterwater and the lovely Langdale Valley. 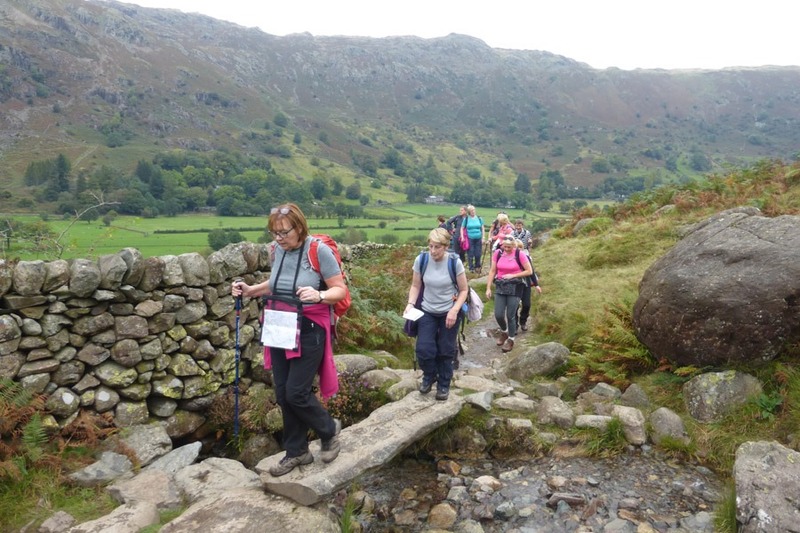 I joined the B party on one of the classic walks in the Langdale Valley. 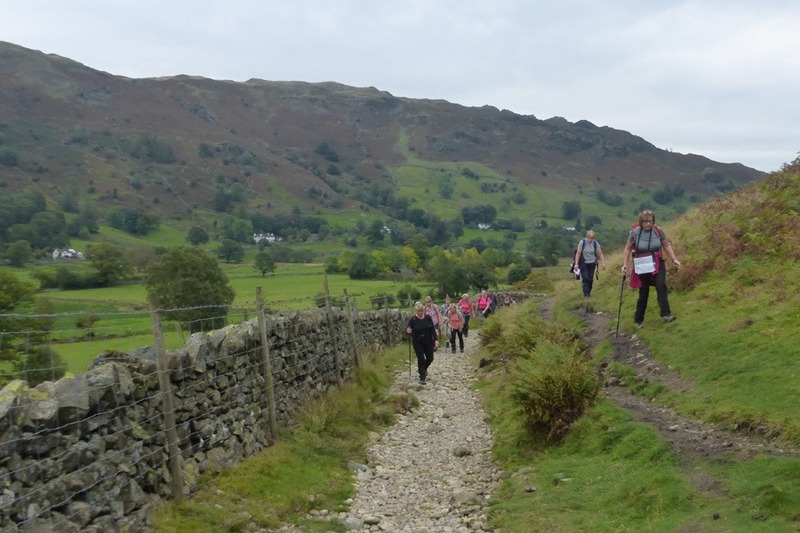 From Elterwater we followed the Cumbria Way to reach Wainwright’s Inn in the village of Chapel Stile. We continued on past the campsite at Baysbrown, on the Oak Howe to reach Side House. Although it was dull, the scenery was beautiful looking across the valley towards the Langdale Pikes and Pavey Arc. At Side House we left the Cumbria Way to continue ahead on a clear path. Passing to the left of some woodland we joined a path climbing steeply up the hillside with Side Pike to our left. 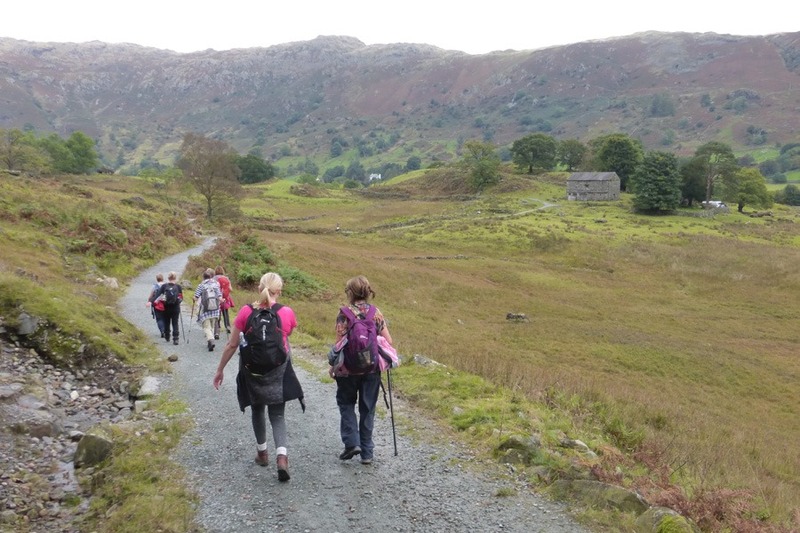 We crossed the minor road which leads to Little Langdale and headed south towards Blea Tarn. 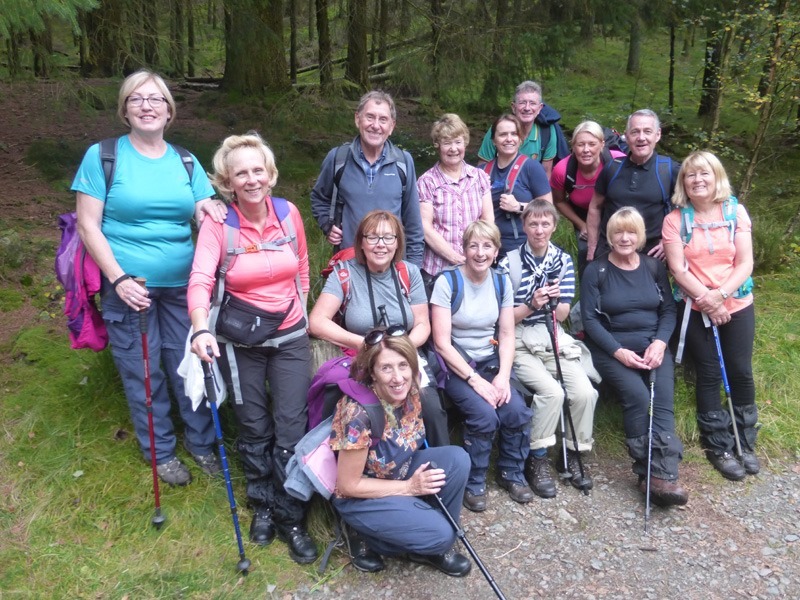 After a pause for a “Groupenphoto” several of us made the short diversion down to the tarn. 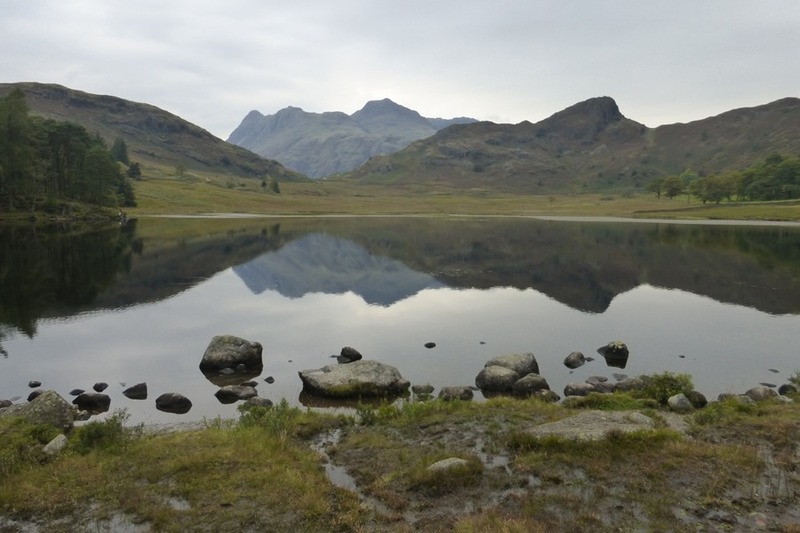 Our reward was the “Classic” view of the Langdale Pikes viewed across Blea Tarn. Leaving the tarn via a footbridge we headed south following Blea Moss Beck through some spectacular scenery. We were heading for the minor road that leads over the Wrynose Pass. A shortcut would have taken us over, or perhaps, into Blea Moss but we did the sensible option and stuck to the footpath. We now had a short section of road walking but we were following in the steps of the Romans who walked this way to their fort at Hardknott. We paused to explore Ting Mound and Castle Rock. The monument known as Ting Mount was an open air meeting place for the local villages dating back to the 7th century. Also known as “Thing Moot” this monument along with many other ‘Moots’ were established in Britain during the 7th to 9th century by settlers from Scandinavia. 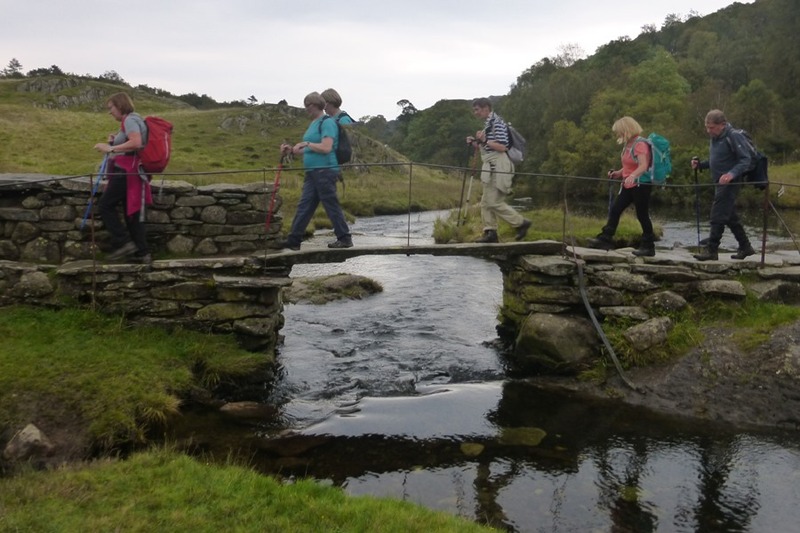 We now headed for Slater’s Bridge, one of the most photographed bridges in the Lake District. But first we veered off to visit Cathedral Cave. 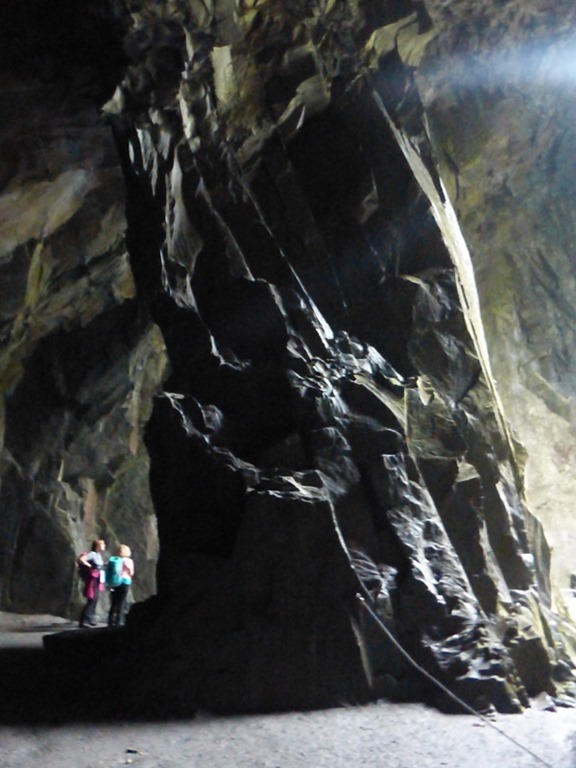 Part of the disused Little Langdale Quarry, Cathedral Cave is the spectacular cavern in the first chamber. Entry is via a tunnel and it was quite a surprise to emerge into this cavern with the huge supporting rock. The two figures show the scale and there was just enough light to get a photograph. A boom in house building in the mid 19th century led to a huge demand for slate.The slate was ‘riven’ and ‘dressed’ before being hauled down the valley to Coniston. 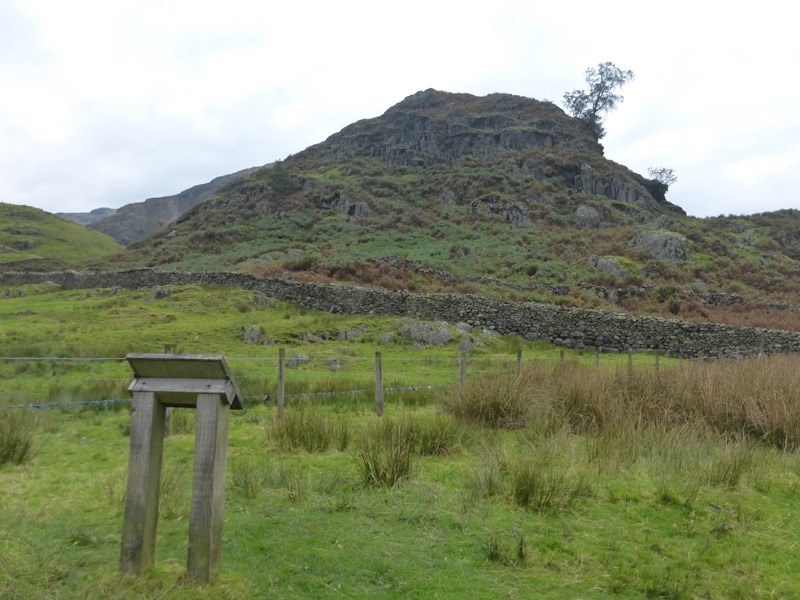 This quarry was bought by Beatrix Potter in 1929 and given to the National Trust. Quarrying continued here until the 1950’s. After this exciting diversion we returned to Slater’s Bridge. It is in two parts with a central large rock and a long slab of slate to cross the River Brathey. Time for another group photo. 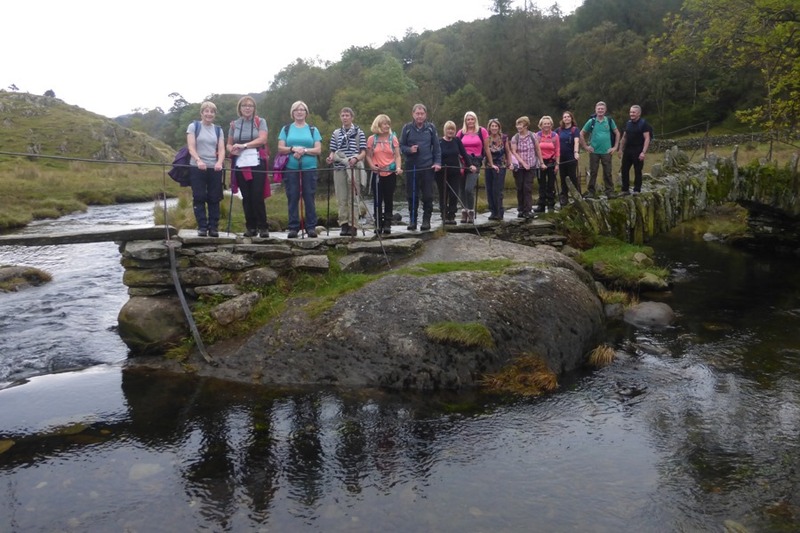 The final leg of our walk was along footpaths and then a very stony track back to Elterwater. We were back in time for refreshments at the Brittania Inn. Mine was a pint of Coniston Bluebird Bitter – just what I needed after a long walk. This entry was posted in Crosby Rambling Club, Industrial Heritage, Lake District, Local History, Photography, Walks. Bookmark the permalink. 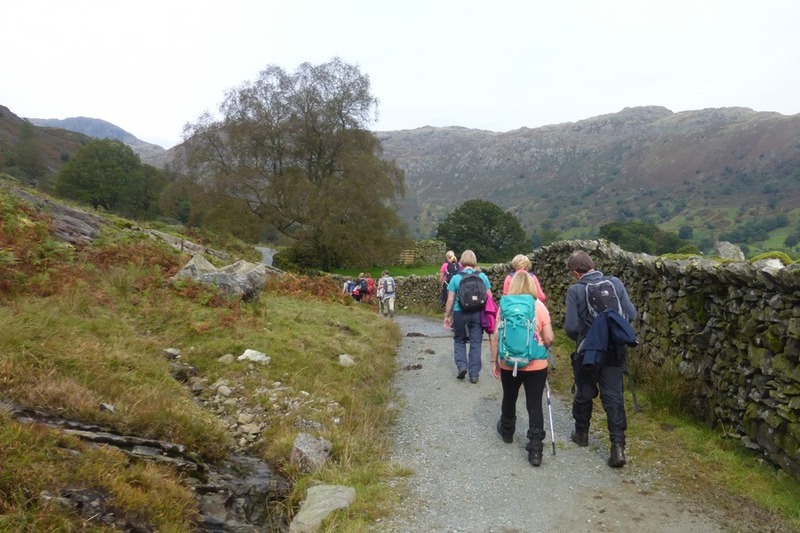 3 Responses to The Langdale Valley with CRC. Looks like you had a good day out Alan. We are in Corsica at the moment which is extremely rugged with some very dramatic mountains. Hope you are getting in some walking. Beaut photos, interesting history. Thanks again for sharing them Alan.